A bustling urban epicenter, especially one scattered across a multitude of floating islands, warrants a bold musical statement that matches its liveliness. 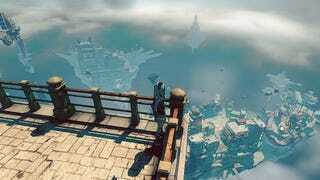 The cities of most worlds tend to section off into any number of neighborhoods or districts; Jirga Para Lhao from Gravity Rush 2 is no exception, though it distinguishes itself by orienting them vertically. Each neighborhood gets its own theme song that kicks in whenever Kat sets foot, and though each one is good, the uncontested highlight is the tune for the city’s densely populated commercial hub, Lei Colmosna. An upbeat multi-instrument melting pot extravaganza in the spirit of a New Orleans summer, it does lots to make even the mere act of running through the city such a fun little time, and it accomplishes that with a proper dash of jazzy musical complexity and instrumental interplay. At least half of the song is in five-beat meter, amping up its danciness with subtlety, though also switching to a conventional four-beat when the moment is right. Everything from a horn section to the violinist to the pianist also frequently trades places as the lead instrument. “Lei Colmosna” never remains in a single phase for more than a half minute—a restless city expressed in sound—which means that it can avoid getting old even when it gets looped tens of times.